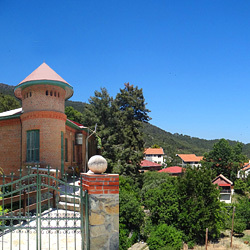 Travelling on the Nicosia-Troodos tourist road and entering the Galata community, in your right you face the "Panagia of Podithou" church. 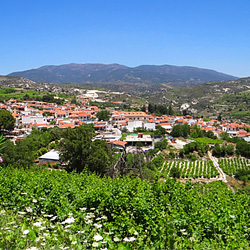 The "Panagia Eleousa" church (Blessed Virgin Mary, the all-merciful), known as "Panagia tis Podithou", is what remained form a small Monastery that today does not exist. 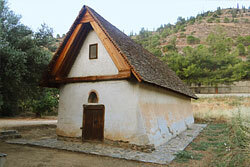 The church is built at the centre of a long and narrow valley close to the riverside of Klarios. The church's shape is rectangular and -in the east -it ends in a semicircular apse. The internal dimensions without the apse are 12 x 4 meters. It is surrounded by a Π -shaped gallery that is covered by the same V-shaped, wooden roof, which is capped by tile plates made by tile-makers from Galata. 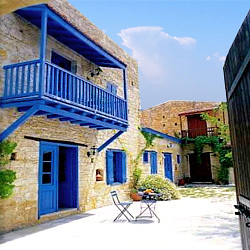 It was built in 1502 by Demetrios de Coron and his wife Helen. 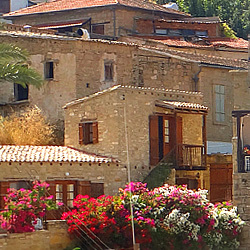 Demetrios and his family were one of medieval Cyprus's families of Latin descent that were Hellenized. In 1461 Demetrios was the commander in the "Pentagia" region and was in favour of Iacovos, illegitimate brother of the legitimate queen Charlotte, who was illegitimately claiming the royal crown of Cyprus. 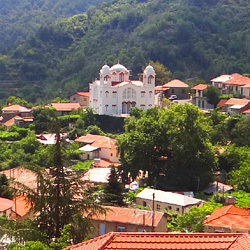 Forty-one years later, in 1502, Demetrios de Coron built the "Panagia Eleousa" church that was later renamed "Panagia tis Podithou". 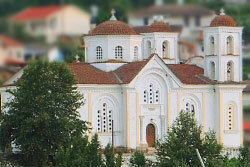 "THIS DIVINE AND VENERABLE CHURCH OF THE ALL-HOLY, MERCIFUL MOTHER OF GOD WAS RAISED IN THE YEAR OF OUR CHRIST 1502 THROUGH EXPENSES AND MUCH DESIRE OF KIROU MISER DEMETRI DE CORO AND HIS WIFE ELENI , FOUNDERS OF THIS HOLY MONASTERY AND THOS OF YOU WHO READ THIS PRAY FOR THEM AND WISH THEM HAPPINESS THROUGH OUR LORD, AMEN". 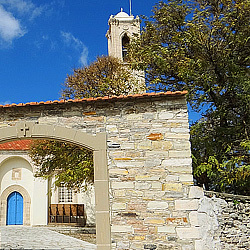 The "Panagia tis Podithou" church was not decorated with frescoes in its entirety. They cover the external side of the west wall, the internal west pediment, the eastern pediment, the quadrant of the apse, and the semicircular wall of the apse.. The Crucifixion in the internal western pediment does not resemble the familiar unadorned Crucifixion of the Byzantine tradition. It is a scene with many characters, influenced by Western painting. It looks more like a religious painting with many details. The Crucified Christ and the thieves, the -westernised -soldiers on horseback, the soldier that is breaking the thieves' legs, the Virgin Mary that tumbles to the ground unconscious, the soldiers that are rolling dice for Christ's tunic and quarrelling, Maria Magdalene embracing the base of Christ's Cross, and -finally -the enigmatic figure of the monk on his knees. The Holy Towel is pictured at the top of the eastern pediment. The two "visions" of the Prophet Moses are depicted further down. On the left, Moses is receiving the plates with the Ten Commandments from the hands of God. On the right, Moses is bending down so as to untie the lace of his sandal. Before him and higher above there is a depiction of the Virgin Mary with Christ in an "engkolpio" (shape of a handbook), in the midst of the Burning Bush's flames. In the apse's quadrant and in a majestic composition, the Virgin Mary is depicted enthroned and having Christ on her knees while the archangels Michael and Gabriel are turned toward the Virgin Mary, holding candles and admiring her. "…It is perfect in composition, very beautiful in appearance, and quite rich in internal reflection, worked with delicacy and grace, craftsmanship and studiousness, and with clarity of perception…"
Under this wonderful -oval shaped - "baby-holding" Virgin Mary, there is a depiction of the Apostles' Holy Communion in two scenes. On the left there's the sharing of the "Artos" (Holy Bread) and on the right the receiving of the "Enos" (Wine). Then come the following Hagiographies from the Old Testament, which are mentioned amongst the Apocrypha (secret, non-canonical gospels) of St Jacob. Joachim and Anna offering the gifts, the Prayer of Joachim, the Prayer of St. Anna, the embrace of Joachim and Anna, the Birth of the Virgin Mary. The church's icon screen is considered as one of the best woodcut, gild-edged icon screens of the 16 th century. Unfortunately, neither the Cross up above nor the small icons high up the icon screen are in existence. The Bema Doors of the temple, works of art with great value, have been stolen in the beginning of 2003 and their whereabouts are unknown. 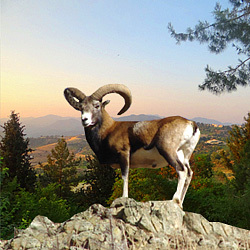 The name "Podithou" or "Podythou". The centre of the entire hagiography in the "Panagia tis Podithou" church is the Enthroned Virgin Mary Holding the Infant Christ in the apse of the Holy Bema. The positioning of the Burning Bush at the highest point of the temple is an innovation emphasising the "Vision" of Moses. "Untie the shoes from your feet" said God to Moses when he stood before the Burning Bush in Mount Horeb, " Apodithou ta ipodimata sou" (in Greek, remove your footwear), the priests and preachers would explain to the faithful, analysing the words of God toward Moses. Thus the name "Panagia tis Podythou" (Virgin Mary of Podythou) or "Po'ythou" in the dialect of the people until today. In the south-east of the church there was the two-level house, the ground level of which was known as the "School of the Podithou Monastery". Unfortunately it was demolished in 1950. In 1735 the Russian traveller Vasilios Barsky refers to the monastery of "Podithou", which he visited. "It ha a small church covered in tiles…" He mentions the harsh and miserable conditions under which the two monks live because of the Moslems, which grab by force foods and drinks. 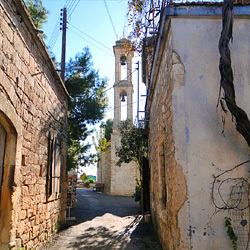 UNESCO has included the church of "Panagia Podithou" amongst the 10 Byzantine churches of Cyprus that were deemed to be of particular importance and were included in the list of World cultural heritage. 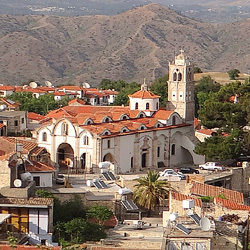 The Metropolitan Bishop of Keryneia, Makarios II, used to call the church as "mikri Faneromeni" (meaning "a smaller version of the Faneromeni church") so as to emphasise its splendour by comparing it to that of Nicosia's. 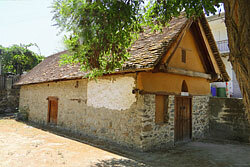 It was constructed in 1930 with donations and voluntary work by the community's inhabitants. "DURING THE TERM OF THE ALL-HOLY METROPOLITAN BISHOP OF KERYNEIA MAKARIOS WAS THIS VENERABLE CHURCH OF THE HOLY MOTHER OF GOD RAISED OVER THE POSITION OF THE OLD CHURCH WITH HIS EXPENSES AND THE CONTRIBUTION OF THE PIOUS CHRISTIANS. THE CONSTRUCTION STARTED ON 2/1/1929 AND WAS COMPLETED 30/10/1930 DESIGN AND SUPERVISION OF ARCHITECT FILIPOS LOIZOS"
"THIS CHURCH IS INSTITUTED DURING THE TERM OF METROPOLITAN BISHOP OF KERYNEIA MAKARIOS. WITH DONATIONS FROM EVRIPIDES GEORGIADIS AND HIS WIFE ANNA -FROM STROVOLOS -IN THE YEAR OF THE LORD 1930 MONTH OF NOVEMBER 2 A DAY SUNDAY"
The church's entire furnishing was completed through donations by the inhabitants and monks that served in various monasteries, especially that of Kykkos. Everywhere one can read, "EXPENSES PAID BY…". For example, in the High Altar, " EXPENSES PAID BY THE PRIEST AND MONK NIKODEMOS KYKKOTIS, FROM GALATA", "EXPENSES PAID BY IACOVOS ARNOPOULOU", et al. Great benefactors of the community and donators of the church are the dear departed Church Steward of Kykkos, Panaretos, the Vicar of Keryneias's throne, Iacovos Arnopoulos, and others. In the church's vestry several Holy Vessels, veils, vestments, ancient buckles, censers, a cross, a Gospel from 1745, and other items are kept. 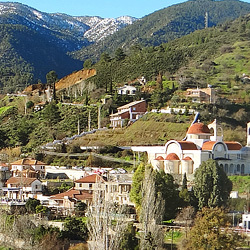 The small church of "Theotokos" (Mother of Christ, Virgin Mary) or of "Archangelos" (Archangel) as it is known, is located quite close to the "Panagia tis Podithou" church.
" 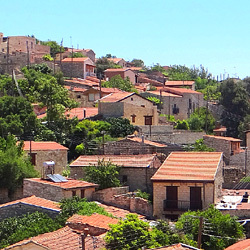 + THE VENERABLE CHURCH OF THE ALL-HOLY MOTHER OF GOD AND EVER VIRGIN MARY WAS RAISED THROUGH CONTRIBUTION AND EXPENSES BY MISER STEFANOU ZACHARIA AND HIS WIFE LOEIZAS. AND WISH THEM HAPPINESS AMEN. AND IT WAS ILLUSTRATED WITH EXPENSES OF MISER. POLOU ZACHARIA AND HIS WIFE MANDELENA AND THEIR CHILDREN. WISH FOR THEM THROUGH THE LORD. THIS PAINTING WAS COMPLETED IN THE 17 TH OF JANUARY 1514 BY THE HAND OF SYMEON AXENTIS"
The "Prayer" ("Deisis") with the donators are depicted in the north wall and the above founder's inscription. Christ is sitting on a throne in the middle. Below Him the Virgin Mary and John the Baptist are pictured in a stance of prayer. The Virgin Mary is pointing with Her right hand at the donator, who is depicted under the "Prayer" along with his family, offering the church's model. Under Christ's feet there is the founder's inscription in seven lines. Zacharias Polos is wearing black clothes and a cap. He is kneeling and offering the church's "mock-up" and its key. His son, who is kneeling before him, is wearing long, white clothes. To the right of this beautiful representation of the "Prayer", the wife of Polos, Mandelena, and their three girls are kneeling. Mandelena is kneeling, dressed very opulently and ornately, and has her hands in a praying stance. Behind her is the eldest daughter kneeling. She is also dressed aristocratically. She is holding an open book that begins with the "Akathistos Ymnos" (a Hymn in honour of the Virgin Mary during Lent that is chanted while standing). The entire "Prayer" fresco is of excellent artistry with beautiful colours and many details in all the faces.The chapel's frescoes are well preserved and include scenes from life, the Lord's Passion, the Resurrection and Ascension of the Lord, and scenes from the life of the Virgin Mary until her Assumption. Also, a large number of saints, martyrs, prelates, holy men, hermits, as well as scenes from the Old Testament are depicted. Above the North entrance there is a small, portable icon of Archangel Michael (17 th century). A liturgy is conducted on the 6 th of September "in memory of Archangel Michael's miracle at Chonae". In the Holy Bema's "prothesis" the "Akra Tapinosis" is painted with the inscription "APOKATHILOSI" (removal of Christ from the cross). In the semi-vault of the apses, the Virgin Mary is painted, standing without Christ, praying amongst two angels that are admiring her. 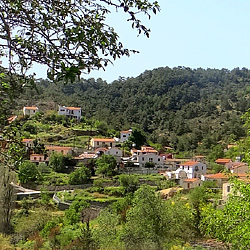 In the middle of the village and quite close to the "Panagia Odegetria" church, stands the small church of "Agios Sozomenos". It is a single-aisle church that is surrounded on three sides by galleries, which are covered by the same roof that covers the church. Its internal dimensions are 11,80 x 3,79 metres. 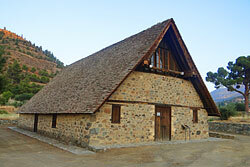 It has a roof "saddled" with tile plates, like almost all of the old churches in the Troodos region because of the great snowfall and the voluminous rainfall. According to the founder's inscription it was constructed in 1513: " + THE HOLY CHURCH OF THE SAINT AND OUR FATHER SOZOMENOS WAS RAISED AFTER DONATIONS AND EXPENCES BY KIROU IOANNOU ANAGNOSTOU AND NOMIKOU TEMPRIAS PAPATHEODOROS AND PNEVMATIKOS IOANNIS MAXIMOS ARGYROS OF KALOGYROU TZORTZES OF KALOGYROU KYRIAKOS OF ERINYS STZANYS OF MILLOMENOU YIOTIS OF MILLOMENOU. 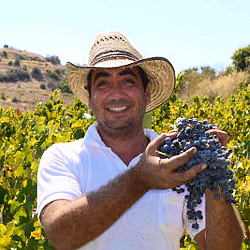 KOSTIS OF MILLOMENOU. STAKOS OF KALOGYROU, PAPAIOANNIS OF SIMONES, DEMETRES OF KOSTAS, GIORGOS OF KYRIAKOU, AND HIS BROTHER PARASKEVAS, ALL HAVING THE SAME SHARE, ARE THE 13 FOUNDERS AND WISH FOR THEM THROUGH THE LORD, AMEN. COMPLETED IN THE 3 RD OF THE MONTH SEPTEMBER 1513 BY THE HAND OF SYMEON AXENTIS. + THE CHURCH IS A HEAVEN ON EARTH WHERE THE HEAVENLY GOD RESIDES AND INDWELLS AND SAUNTERS REPLICATING THE CRUCIFIXION AND BURIAL AND RESURRECTION OF CHRIST "
Among them, the icon of St. George stands out, covering an area of ten square feet. It depicts Saint George on horseback, striking an oversized dragon with red wings and a tail tied in a knot around his horse's leg. The princess has tied the dragon by the neck with a rope and is dragging it toward the palace. The King extends the keys toward the victorious Saint while the Queen is observing the events. Trumpet bearers, standing by her side, sound their trumpets. Under the icon the following is recorded: "Prayer of the Lord's servant Georgios Maximos and his wife and their children, Amen, by the hand of Symeon Axentis". Further on, on the north wall there are scenes from the Life of the Virgin Mary taken from the Apocryphal Gospel of Jacob, brother of Christ, the Prayer of Joachim, the Embrace of Joachim and Anna, the Birth of the Virgin Mary, and others. The series ends with a very large depiction, which has the Assumption of the Virgin Mary as its subject. The Virgin Mary is in her deathbed. Up above the sky is covered by the Apostles that arrive in a cloud guided by an angel. Christ, surrounded by angels, is embracing the Virgin Mary's soul, as if it is a swathed infant. In the Holy Bema, at the apse's quadrant, the Virgin Mary is depicted in a stance of prayer amongst the Archangels and -below -the Hierarchs (Prelates). In the north external wall, the Second Coming is depicted with the Righteous Judge in a throne surrounded by the twelve Apostles, having the just to His right and the sinners to His left. Then follows a large icon of "Riza Iessai" (Root of Jesse), depicting Christ's family tree. Finally, two zones of representations follow -the eight Ecumenical Councils of the Eastern Orthodox Church. They are the only frescoes in Cyprus depicting the Ecumenical Councils. 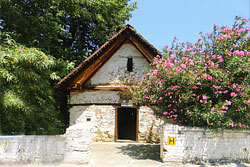 The "Agios Georgios" small church is located in the middle of the village, below the road that connects Galata with Kakopetria. 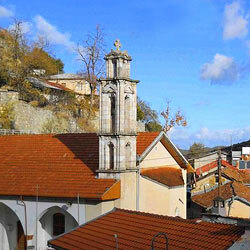 The church dates back to the first quarter of the 16 th century. Contrary to other churches, it has a north-to-south direction. The only fresco is located on the north wall, close to the icon screen. It is quite large and depicts St. George on horseback killing the dragon. It bears the following sign: "St George the Galatites" (from Galata). Around the representation there are scenes from the saint's martyrdom. This work is probably of the 16 th century. 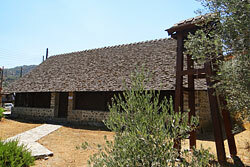 A liturgy is conducted here on the 23 rd of April, this being the Saint's Day. 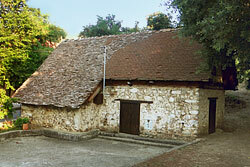 The small church of "Agios Nicolaos" (St. Nicholas) is found at the village's entrance in the west, close to the old Kalliana-Galata road, and dates back to the 15 th century. It is a single-aisle, rectangular one with internal dimensions of 7 X 3,63 metres. The church is built with crude, unrefined stones and mud. The church's walls are 0,58 -- 0,60 meters thick and 2,34 -- 2,36 meters tall. The floor is covered with bricks.